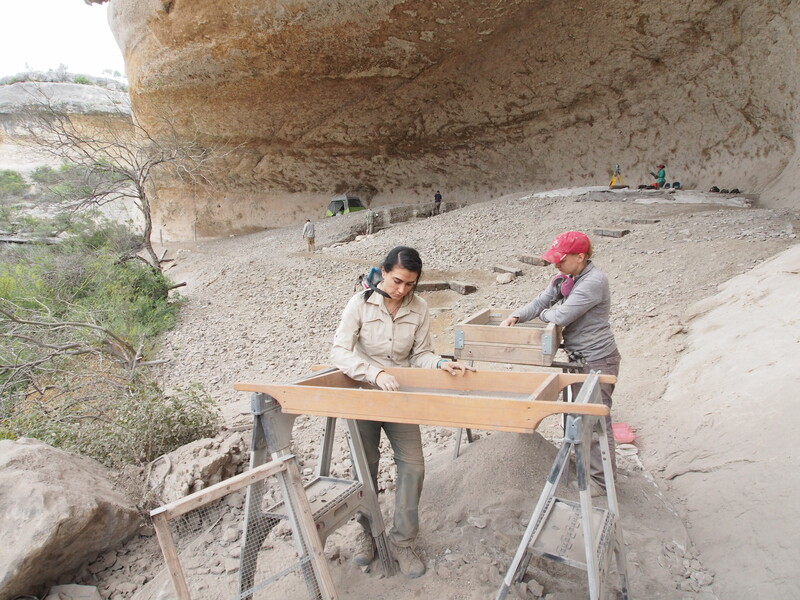 Over Spring Break last week I spent several days at Eagle Cave eying progress. The 2015 season is the first time since the inception of the ASWT research program in 2009 that I’ve worn only one hat, that of principal investigator (P.I.). 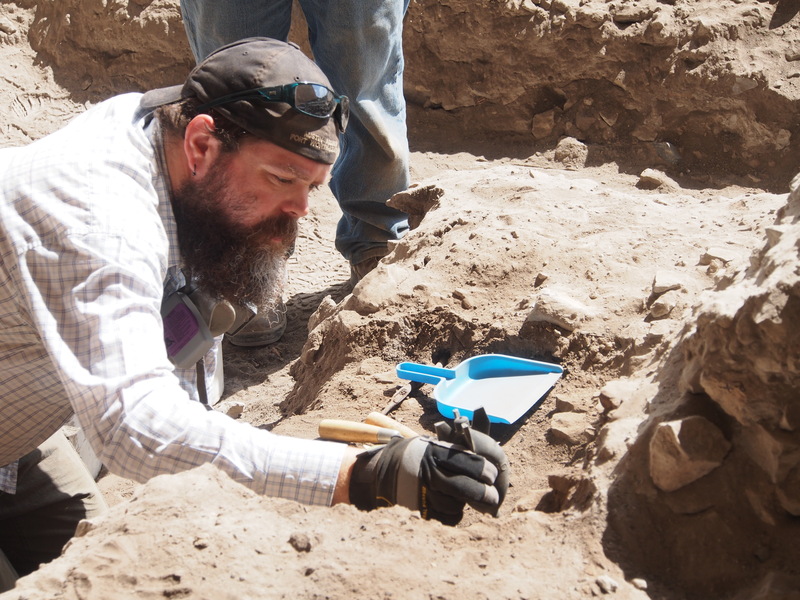 Until this season I have also been the field director, meaning I was responsible for making most of the day-to-day strategic field decisions, as well as setting the overall research agenda, organizing the endeavor, and arranging funding and logistics. And so I found myself in Eagle Cave on Thursday, March 20th looking at the ongoing investigations with field-fresh eyes. 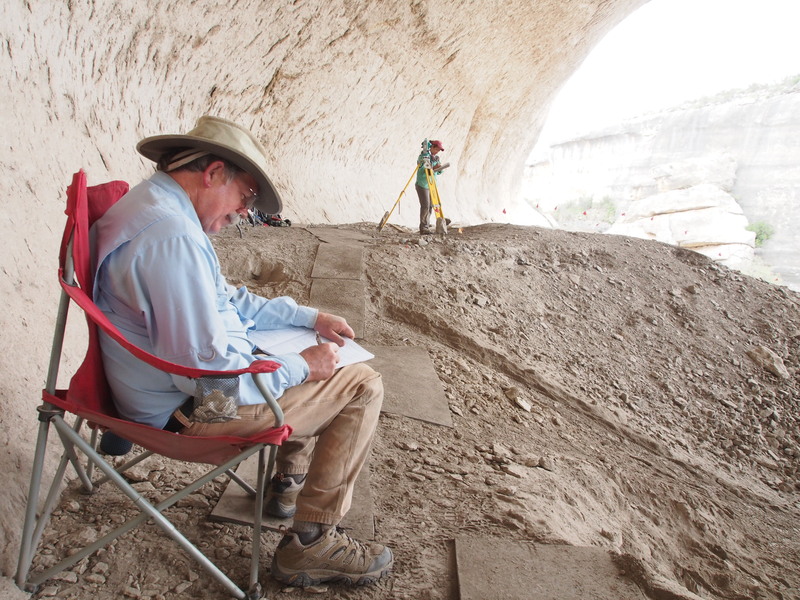 I (Charles) have learned from experience one of the most important things to have at any archaeological site is a comfy chair for the PI to sit in and enjoy the view. Below is what I wrote in my field journal as I sat looking out from the back of the shelter in an almost comfortable camp chair. Other than minor spelling and punctuation edits and the added contextual explanations in italics, this is verbatim. 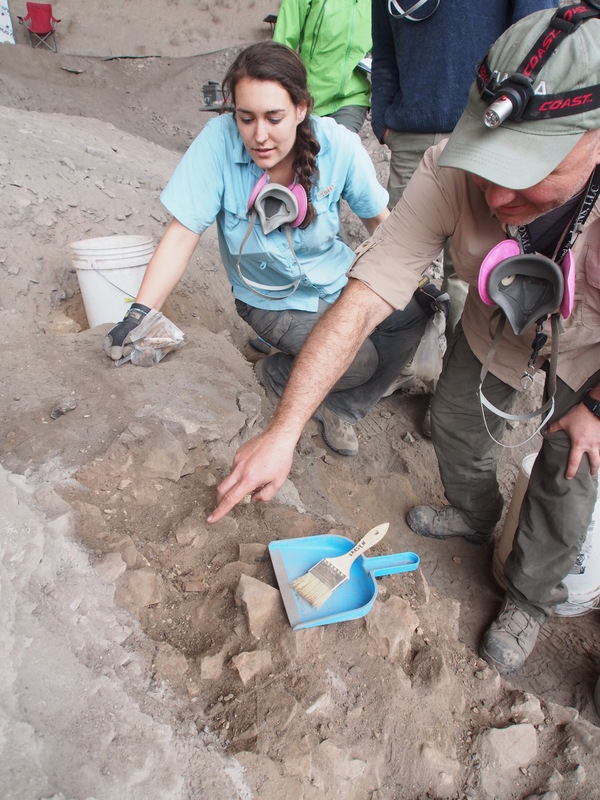 Kevin Hanselka (left) and Emily both were identifying and describing strats (individual stratigraphic layers) within PS12 and PS13, respectively. Larsen delicately excavates through a fiber/FCR layer. 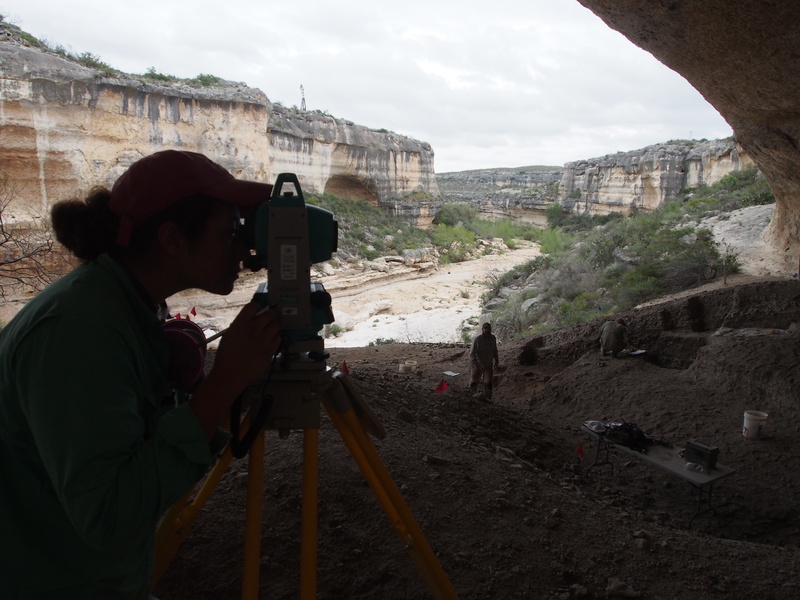 Tori running the TDS – “shooting” in everything from strats to matrix samples to coprolites. Kevin points to examples of different plant parts exposed in profile. TxState graduate student Amanda Castaneda looks on. Lindsay and Elizabeth screening sediment from their units, while the rest of the crew works in the background. Work scene on March 20, 2015. On far left field director Charles takes a break from shoveling out disturbed matrix while keeping an eye on the busy crew. On the far right Elizabeth holds a reflector board to improve the lighting on the area where Bryan is taking yet another round of SfM images. And that is the Eagle Cave 2015 progress as eyed by this P.I. 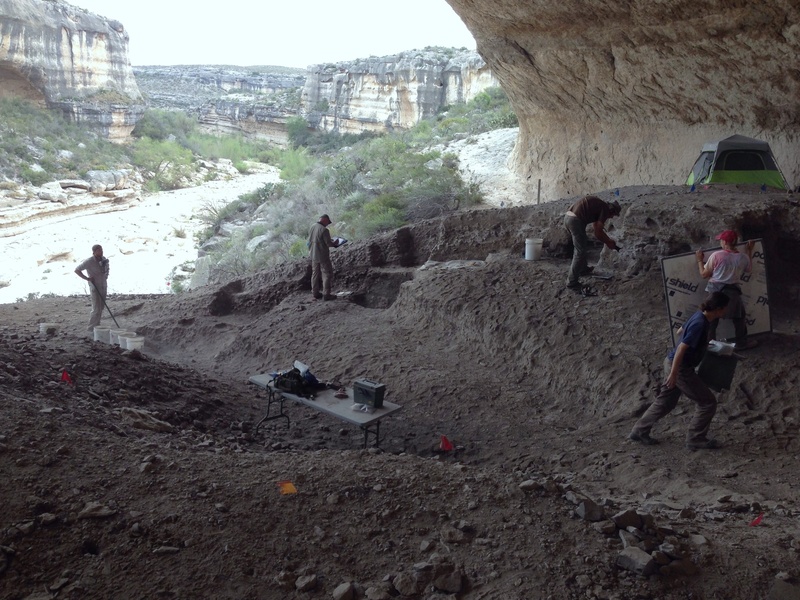 I will admit that as I started to write most of the above in my field journal it dawned on me that ASWT blog readers might appreciate a look at the excavation scene at Eagle Cave. I had realized that at the moment I was superfluous – most of the crew knew what they were doing and Charles was doing a marvelous job directing the scene. I could sit back and take it in as a participant-observer. 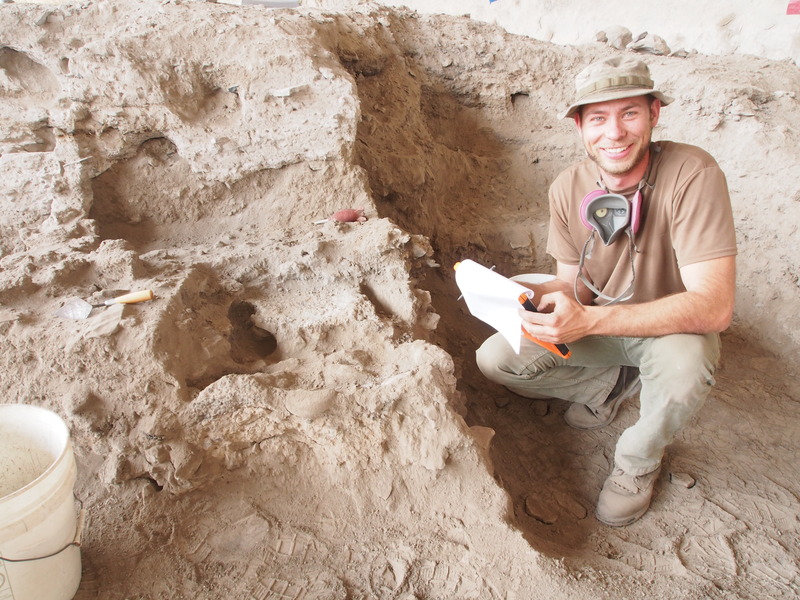 A competent archaeological crew intelligently and diligently investigating a fascinating rockshelter in a remote corner of the natural and modern world is indeed a joyful thing for a principal investigator to behold. I’m already looking forward to my next trip. This entry was posted in Eagle Cave, Spring ENC 2015 Posts. Bookmark the permalink. It is ever so much more complicated than I ever would have imagined. Thanks for the insight. Im working on a short(3min) educational movie about argeology in The Netherlands and would like to use one picture from your website. Can i please use the picture as discribed below. You’re more than welcome to use an image from our blog.